Protein is good. Ergo, it follows that more protein is more good, right? That's the premise under which it appears that many of us operate, and it seems like it would be easy to figure out whether this makes sense. But there's more to the question of protein super-dosing than a simple yes or no. Before we get into anything else, I need to explain how muscles actually grow. Two processes compete within your muscles at all times: protein breakdown and protein synthesis. The signaling for each of these operates more or less independently. To increase muscle mass, the gap between these two processes must be widened by lowering muscle protein breakdown (MPB), while raising muscle protein synthesis (MPS). These processes can be differentiated by looking at how much dietary or otherwise exogenous protein incorporates into muscle, and how much is excreted. There are a variety of different ways this has been done historically, and it's how scientists can determine the dietary protein levels needed to maximize MPS. Achieving maximum MPS requires more than just eating a certain amount of protein. Timing, protein type and insulin response create a whirlpool of anabolic effects, making it a complicated process to achieve a maximum anabolic state. The question is not how much protein you should consume, but how to keep free amino acid levels at the right level, at the right time, for the right duration. 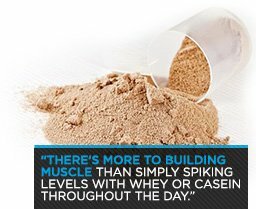 There's more to this than simply spiking levels with whey or casein hydrolysates throughout the day. 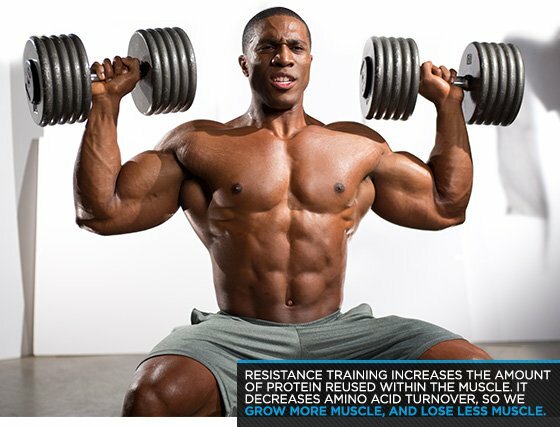 Done the wrong way, this can actually increase muscle protein breakdown. It would be easy to point to things famous bodybuilders have said over the years, invoking the likes of Ronnie Coleman or Dorian Yates to argue that you need at least 2-4 grams of protein per pound of body weight in order to grow. Before you go that route, however, there are a few things you need to understand. First off, Coleman and Yates don't need to read this article, because whatever they used to do, whether it was right or wrong, they grew. If you want to mimic their respective styles, you'd have to go even farther back and choose a different set of parents in order to secure yourself the same genetic advantages they had. Here is where we get to the other part of this whole thing: decreasing muscle protein breakdown. Despite the power of growth signals like insulin, the negative regulators of growth (like myostatin) have far more influence on hypertrophy. Resistance training causes specific adaptations to decrease negative regulators. It also increases the amount of protein reused within the muscle. More specifically, it decreases amino acid turnover. We grow more muscle, but we also lose less muscle, too. If you subjected professionals like Yates or Coleman to tracer method studies and biopsies, their rate of muscle growth would be the same as — or slightly higher than — the average-sized lifter, and that rate would still be optimized with 1 gram per pound of protein per day. The rate at which they lose muscle, however, would be significantly lower — along the lines of 10 times less. Unlike us, they lose nearly none of their hard-earned muscle mass. The reason? Lower protein turnover. If anything I said thus far has resonated, and you starting putting the pieces of the puzzle together, you're likely wondering whether super-dosing your protein will have any effect at all. If that's the case, you're also wondering whether there's any reason at all to keep spending so much money on tubs of casein and whey, and pounds of fish and beef. Typically, when people begin super-dosing with protein, they do so because they've tried everything else, and they're desperate. At first, you'll feel great. You'll recover more quickly from your workouts; you'll tighten up; and your training will improve for a few weeks. After that things go downhill fast. You start losing your appetite, become lethargic, and your gains stall. All this excess protein makes you feel good initially, for a number of reasons. First, you were likely eating too few calories, not too few grams of protein. When dietary protein levels go above the 1 gram per pound mark, the only metabolic change that occurs is protein oxidation. Your body starts getting energy from protein, and it begins replenishing glycogen reserves by converting the amino acids into glucose through a process called gluconeogenesis. This excess protein neither makes you bigger nor stronger. Rather, your body finally gets enough substrate to use for energy, and it can now shift from catabolic to anabolic to get you growing again. Does toxicity exist at high dietary protein levels? Well, there's no evidence of this in the scientific literature. Kidney function is normal, if not enhanced, and bones become stronger. So, why not get all your extra calories from protein? Why not keep your carb and fat levels low or moderate and make up the difference with protein, consuming three or more grams per pound of body weight every day? Well, if you're concerned with building strength or mass, there's plenty of reason to forego this extra protein. In nitrogen retention studies, when less nitrogen is flushed from the body than is taken in — and in which higher doses of protein don't cause greater levels of nitrogen excretion — the body doesn't incorporate the unaccounted-for protein into muscle tissue. It reaches the point where it can no longer clear the massive amount of urea. If your body can't get rid of this, it builds up throughout the day in your system. This sounds bad, of course, but the only real consequences are the aforementioned loss of appetite and lethargy. If you hit the gym after work, you're screwed, because that's when urea buildup begins curbing enthusiasm and focus. The saturation point, taken from the accumulation of data, appears to be around 1.3 grams per pound, so there's a little wiggle room between optimum and inferior. So, what we have here is the fact that scientific research and empirical data make it clear that going beyond the 1-gram-per-pound mark is unnecessary, wasteful and potentially detrimental for strength and physique athletes. Of course, I'm not opposed to high-protein diets in all situations. Because of dietary protein's ability to accelerate metabolism, preserve muscle mass, curb appetite and avoid being stored as fat, increasing protein content in the diet—or shifting macronutrients in favor of higher amounts of protein—is ideal for losing body fat, whether you're a physique competitor or an obese beginner.